There is some really interesting material in here - particularly about the power that is increasingly in the hands of tech companies and the ways that democracy could change. Unfortunately, though, this is done in overly-wordy fashion - in this, the book's more like a business book than a science book: it could be a third the length and still contain all the significant material. It's interesting that at one point, Susskind refers to the book The Future of the Professions by his father and brother. That too suffers from excessive repetition, and the business/textbook tendency to have to dream up unnecessary names for things. 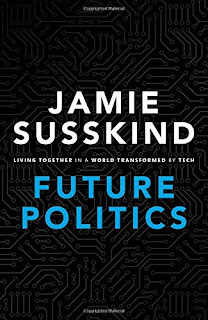 (At one point in Future Politics, for example, Susskind pointlessly defines 'Deliberative Democracy, Direct Democracy, Wiki Democracy, Data Democracy and AI Democracy.') But the good news is that this Susskind is a significantly better writer than his father and brother - mostly this book is written in English rather than academic-speak. 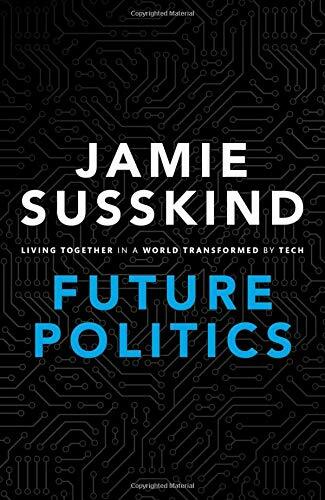 Perhaps the weakest part here was the future gazing at the beginning, where Susskind tends to wildly underestimate timescales for, for instance, the immersive adoption of self-driving cars or smart home technology (yes, for example, there are the robotic vacuum cleaners he mentions - but they cost six times as much as an ordinary cleaner and don't do the job as well). What he doesn't seem to get is that just because something is technically possible doesn't mean it will be widely bought into outside early-adopting tech lovers for a considerable time. Taking an example from a parallel situation: it's perfectly possible to build a zero carbon house - one that has no net carbon emissions in its day-to-day operations. And a few people have. But it will be decades or even centuries before they are dominant, because it would mean replacing most of the existing housing stock, and because even now most new builds aren't zero carbon, because it's too expensive to build them that way. So, bringing this back to Susskind's examples, I don't think people will be rushing into, say, self-restocking fridges, because again they're far more expensive than the ordinary variety, and most of us like to buy things when we want rather than when a fridge wants. Similarly, I think he vastly underestimates how long it will take self-driving cars to become common. Initially they will be very expensive, and it will take a long time for the majority to trust them. Also Susskind doesn't at all address the psychological problem of adopting them. Fans argue they will reduce deaths on the road. Great. Let's say they reduced the worldwide figure from 1 million to 250,000. That seems wonderful - 750,000 lives saved. But it would be a political minefield. Because those are 750,000 hypothetical lives. But 250,000 actual people will have been killed by self-driving cars - and their families will blame the technology. It seems, then, that some of the issues Susskind discusses are perhaps a lot farther ahead than he thinks. But we can't dispute, for example, the power already in the hands of social networks, search engines and the like, or the impact that technology is having with democracy. And because those issues are already with us, despite its faults, this is an important book and well worth reading.